This week's 'In the Classroom' focuses on the social activism that arose in the 1960s and 1970s. 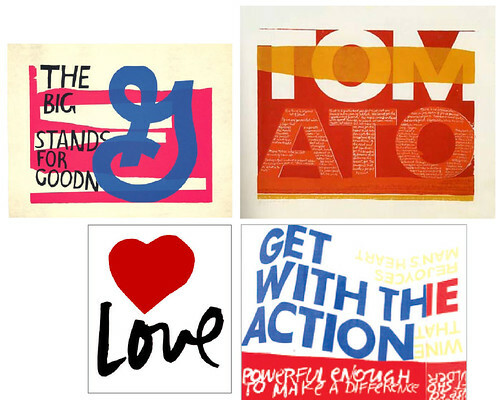 There has been an amazing amount of buzz about the graphic-artist Sister Corita, neé Corita Kent, in the blogosphere recently. Reading about her for class this week, I can understand why. As a sister in the Immaculate Heart of Mary, she ran the art department at the Immaculate College in California for years, slowly achieving renown for her creative teaching practices and brilliant serigraph poster designs. Using Pop art tactics--incorporating slogans and logos from products like Pepsi, General Mills and Wonder Bread--Sister Corita manipulated bold text and bright colors to create graphics that encouraged her viewers to find the beauty in life and God. It must also be noted that Sister Corita worked without the benefit of computers; her twisting type effects were done by drawing the type, bending and folding the paper, photographing that effect and then painstakingly recreating the photograph. The result were bold and dynamic poster designs that continue to inspire nearly 50 years later. Learn more at the Corita Art Center here. The AIDs crisis started in June 1981 when five men were diagnosed in Los Angeles with what was then known as GRID or 'Gay-Related Immuno-Difficiency'. Within a year, GRID was renamed AIDs, and the disease had become a full-fledged pandemic among gay and minorities communities around the country. Two major groups formed--Act Up and Gran Fury--to create poster and sticker campaigns that lobbied for the rights of the sick, pushing politicians to allocate money for health care and research to solve the crisis. Both groups used bold geometric designs and startling statistics to create posters that would jolt the public into getting involved. My particular favorite is the 'Read My Lips' campaign by Gran Fury. Designed to coincide with 'kiss in' events--where dozens of gay and lesbian couples would meet at a public place to make out, thereby demonstrating that homosexuality was not to blame, it was a disease that was at fault--these posters show that behind every individual was a person, not a stereotype, who deserved help and respect and who simply wanted to be able to be with the person they loved without the penalty of death. 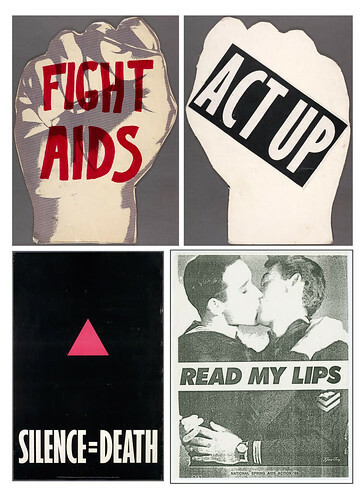 There is so much more to learn about these two groups: more on Act Up here, and Gran Fury here. 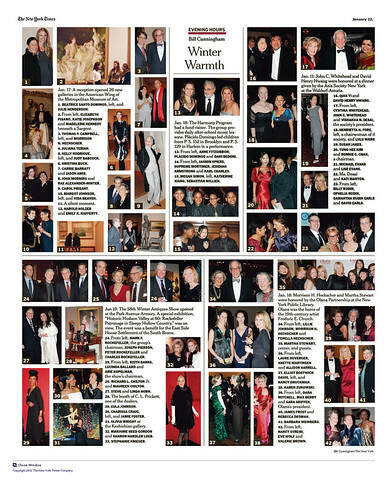 Thanks for blogging about us and getting the message out.